Tee-bags is the name of my 10 year old’s new business. A tee-bag is a tee shirt, recycled (and washed in hot water!) into a reusable shopping bag! He has granted me permission to offer a free tutorial on how he creates shopping bags using t-shirts! Since his dad (my DH) owns E-cycle Group, a green business recycling printer cartridges, DS1 is very excited to follow in his dad’s green footsteps with his own recycling business. Not only is he preventing the tee’s from becoming landfill, he is also providing an alternative to the age old question, paper or plastic! A bonus is that the bags are machine washable, which is a nice option to have when you go to the farmer’s market and get bits of lettuce and onion skins in the bag! The tee-bags also fold up to stuff into your purse or glove compartment–so they are convenient to use, which is a key component to making recycling part of your lifestyle. For more tips on recycling and environmentally friendly choices, visit the eCycle Group Cafe blog! He was able to obtain free tee shirts from our local Freecycle organization (note: Freecycle is an entirely nonprofit movement of people who are giving and getting stuff for free in their own towns. It’s all about reuse and keeping good stuff out of landfills) He was also able to pick up unsold tee shirts from a local rummage sale. After a quick lesson on my serger, he was able to whip out some bags. His BFF worked on the marketing end, providing a beautiful poster, as well as rigging up a wagon for a portable display. Their proceeds go towards a 6th grade (next autumn) field trip. This morning, I took the boys to the local Farmer’s Market, to test the waters. They sold out within one hour!! The boys are really excited, and are already back at work in my studio, getting Tee-bags ready for next week! Turn the tee shirt inside out, line up the bottom hem, and sew or serge the bottom edge together, just above the tee shirt hem. Line up the sleeves seams and cut off the tee shirt sleeves. 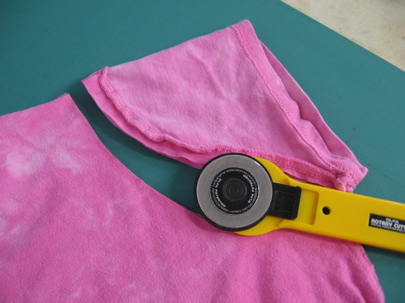 It works best to cut off the sleeve seams! 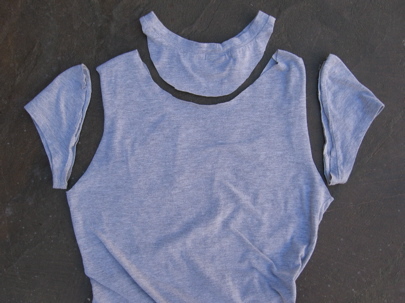 then cut a “scoop neckline” including the back of the tee shirt in the scoop. Here’s what it looks like when all the pieces are cut off. 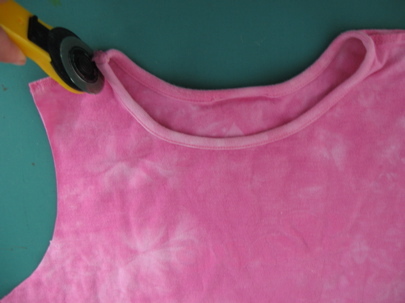 Knit jersey (tee shirt fabric) doesn’t fray, so you don’t have to hem any of the cut edges! Turn the bag right side out, and go shopping! Boy, the apple doesn’t fall far from the tree, does it? What a great idea and a great mom for helping him realize his dream. What a smart son you have Susan. Just like his mom! That is a wonderful idea. Well how smart is that! Great idea! I love it! Kids and the entrepreneurial spirit go together well, and what a good start in life! Kudos to mom for the encouragement. Great idea! Genius! What a great idea on so many levels – you must be really proud of this boy. Love this idea! The boys will earn lots of money doing this! I wonder if I could start a sweat shop in my backroom, putting my boys to work. First I’d have to get my serger fixed. what an excellent idea – must give that a try myself. What a great idea. Glad to see your kids involved in such a great enterprise at such a young age. Good job mom supporting them. That’s a brilliant idea, i have a few old t-shirts that i don’t know what to do with and this might be the perfect idea! What a great idea. My nephew is in the boy scouts and when they start up in the fall I’m gonna suggest this as a project during a scout troop night. Thanks for the idea. This is a great idea, have you thought of using tank tops instead of T-shirts to cut out the labor costs of cutting the T-shirt? I figure tank tops are just as cheap and also have some designs. Also, with tank tops, no worries of fraying since the seams are reinforced anyways. Why can’t adults think outside of the box as well as kids! That’s awesome…you should be so proud! He could probably make some serious money by selling these online (shipping costs are minimal for the weight) if he can keep getting tee’s at goodwill, thrift stores, and donations. This is so smart! Your son is a genius. I am totally going to make some of these. I have been trying to go greener, and reusing tee shirts is even better than buying bags at the store! A perfect idea!!! Great thinking and inspiration by the “little genius” who came up with this idea, and a big thanks for sharing the how-to’s. With four teen boys and a husband, I have a steady supply of old tee shirts… I’m going to get busy and start giving these things away! I love this and am going to make thousands of them!! That is soooo smart! Thanks! Hi, I just wanted to say that I saw a very similar product made on the Today Show. They used staples and duct tape to finish the edges but the idea was the same. I hope your son got credit to this too. It really is a great idea!!! I’m going to try it out after the holidays. Thanks so much to your son from myself. I just made a bunch over the weekend- they were SOO easy! Ironically, I just received an e-mail about the dangers of plastic bags. It definitely makes me feel better about recycling my old t-shirts! What a great idea. You must be pleased your son seems to be following both parents footsteps. It’s simple and great to reuse. Strong enough to put in few more milk bottles. Thanks for great article. I think it’s amazing how many kids care about the earth. If all the kids on the planet think the way this boy does, global warming won’t be a problem in the future. That was simply great, very simple and just great. Hi – great tutorial – I shared a link to it on ecosalon.com – hope that’s ok (it’s in the comments section). I just serged up a dozen of these with some old firefighter t-shirts my husband just couldn’t part with. Now he has cloth grocery bags in his car too! Another thank you to this creative young man! We’ve done 4 workshops so far at our church. The kids like to draw their own designs with fabric markers. We send home the washing instructions to avoid a laundry mishap. This is a great Earth Day project! Your tee shirt bags are great! 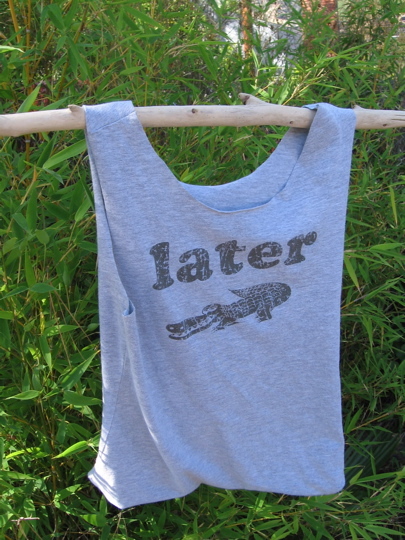 You can do an even faster version with old tank tops, too. Just stitch the bottom shut and you are ready to go! Good tutorial… Good recycling and good for planet earth. Amazing! Thank you! Very simple and you can even be more creative with it, or not, it’s versitle! What a great family project, good for you for helping and encouraging him! It’s lovely that he’s got a supportive family and a good friend to go in with him on it. 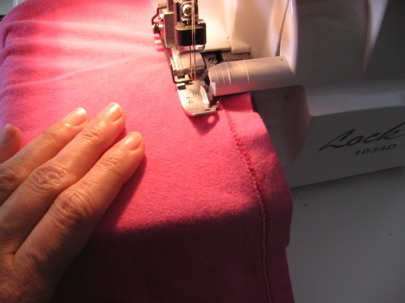 I’ve done lots of sewing, but not with T shirt fabric, does it fray along the arms where they aren’t hemmed? PS- The hot water laundry really isn’t worth anything. Washing machine hot washes don’t get hot enough to kill germs, so it isn’t worth the energy wastage 😉 If you’re really worried about germs, boil the suckers! Sure! 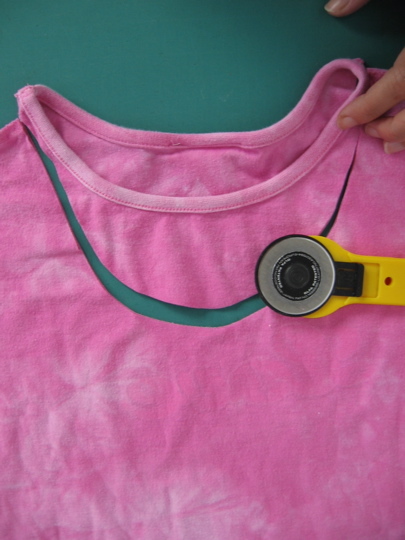 Then you wouldn’t have to cut the neck and sleeves out– double easy peasy!